Every engineer knows that the two sides of any equation should be equal. But when you are dealing with experimental data, sometimes the numbers don’t match up. When Anahid Ebrahimi, who recently earned a doctoral degree in mechanical engineering at the University of Delaware, noticed that an important equation in biomechanics never balanced, she was determined to figure out why. 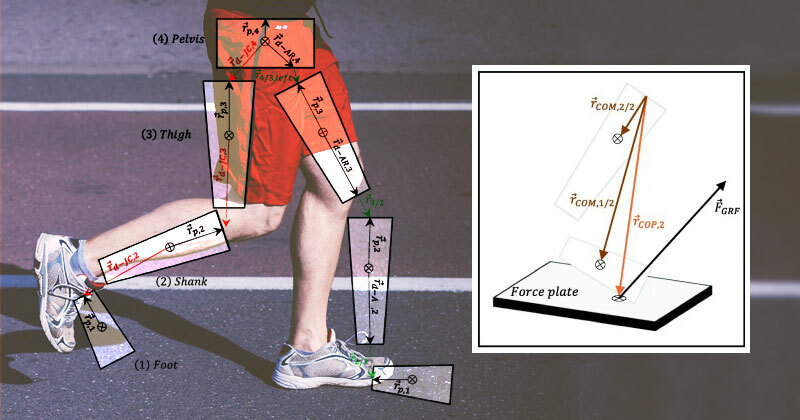 Ebrahimi worked with an interdisciplinary research team that included Jill Higginson and Steven Stanhope, both professors of mechanical engineering at UD, to solve the 6 degree-of-freedom segmental power imbalance in human movement analysis. Their results were published in the January 2018 issue of the Journal of Biomechanics. Human movement analysis can help a range of people—from stroke survivors learning how to walk again to athletes optimizing their performance. By examining how much energy is used by different segments of the lower body, such as the foot, shank, thigh or pelvis, during each step, a physical therapist or other health professional can help people walk or run safely and efficiently. Researchers calculate these values, known as segmental power, in two theoretically equivalent ways. The kinetic method uses segment endpoint dynamics, while the kinematic method measures the rate of change in a segment’s mechanical energy state. Both are calculated in a model with six degrees of freedom to account for all the ways a joint can move: forward and backward, up and down, left and right and twists around three planes. This imbalance frustrated Ebrahimi, who is now a post-doctoral associate at the University of Wisconsin-Madison. “It was a known discrepancy, but no one was talking about why there was a discrepancy,” she said. Through a series of arduous calculations, Ebrahimi deduced that researchers have been ignoring a value called power due to relative segment endpoint displacement. “People didn’t account for work due to sliding at the joint,” said Higginson. When the new methods were tested with experimental data, the power imbalance for the shank (lower leg) was reduced by 98.4 percent, the thigh by 95.7 percent and the pelvis by 95.6 percent. “As engineers and scientists, we want to do our calculations correctly and understand what our calculations mean,” said Ebrahimi. This finding can help other biomechanics researchers develop more accurate models and could accelerate the development of prosthetics and other medical devices for movement. The paper’s authors also included John D. Collins, a doctoral student in biomechanics and movement science at UD; Thomas M. Kepple, chief science officer at C-Motion, Inc.; and Kota Z. Takahashi, an assistant professor of biomechanics at the University of Nebraska at Omaha.